Famous Family Trees takes a slightly different approach to sharing the lives of famous people from history. The lives of 25 different people are included. Their stories are captured with a short biographical summary, and are accompanied by a relevant snapshot from their family tree. It's a visual book. The family trees are drawn with portraits of the included relatives, and trivia about them noted with each. This shows how the people in question were influenced, and the roles their personal life had on the position that made them famous. It also shows connections that were important in their lives. If you look closely, there are even connections between the different trees that you might not expect. The book begins with a simple explanation of how to read the family trees. It includes definitions of key terms (ancestor, descendant, maternal, paternal, etc), and what different abbreviations mean (c for circa, m for married, etc). Families explored range from ancient history (the families of Julius Caesar and Cleopatra) through to relatively recent times (the families of Ned Kelly, Henry Ford, and Nelson Mandela). 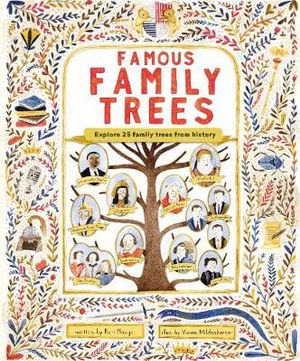 Famous Family Trees offers lots of small details which can be researched further and is a book that could be used successfully in classrooms, or enjoyed as a part of a personal library. Famous Family Trees might also encourage readers of all ages to discover a bit more about their own family tree.